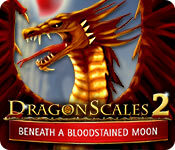 DragonScales 2: Beneath a Bloodstained Moon is rated 4.4 out of 5 by 17. Rated 5 out of 5 by graceland9 from Great Puzzle Game Sure, the graphics are clunky and the dialogue is almost comically over-the-top, but this puzzle game is original and addictive. 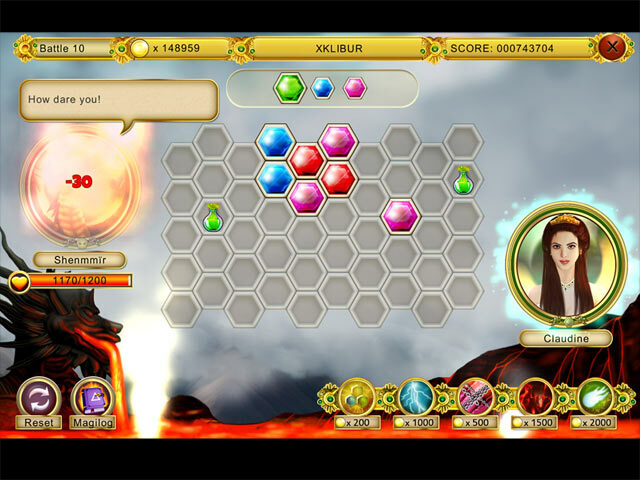 You work with Princess Claudine to match up dragon scales, which clear in groups of 3 and up. The challenges become progressively harder, but along the way you collect gold coins to buy power-ups. 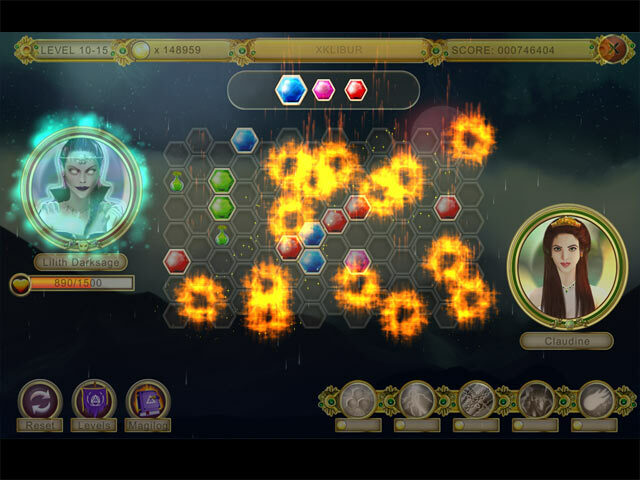 You also win coins by playing mini-games like card matches, slots, etc. When I started this game up, at first I thought No way, I won't even make it through the demo. However, I was sucked in by the great concept and interesting story line, complete with villains like Greedy Greenie and Derek the elf. If you like a thought-based game with different options and a fantasy setting, this is a great addition to your game manager. Rated 5 out of 5 by verimeri from can be difficult but fun I'd forgotten how much I enjoyed Dragon Scales 1 when this came out. It is even better because it does have some mini games in between levels. It is not a super easy game but it is winnable. Took me 28 hrs. 27 min. 56 sec to beat it and I enjoyed every second of it. Hint- if you get stuck on 3-12 go to the forums. Then it is obvious. Thank you to those who wrote into the forums. Rated 5 out of 5 by DaveMyers from Original game This game is very original, you have to match tiles but it's different, not your typical match 3 game. Very well done. Rated 5 out of 5 by alowan from Even better the second time! This game is so unlike the standard Match 3 that I almost want to invent a new category for it… I also have the first Dragon scales game, and I like this one better. I especially like the Practice department, because I couldn’t pass one board of the first game, and so was stuck and frustrated. I still love it, though, and I’m hoping that much practice will help me get past it! I have to say that I love the graphics! They are well above the usual standard. I could live without the music. Not that it’s awful; just that I’m a music snob. But I love the deep and accented voice that cheers me on. That guy could read me the phone book without boring me. Now excuse me while I go buy the thing! Rated 5 out of 5 by XFreak from Great match3 I love this game, great level design that make us gonna play and play until the trial ends. 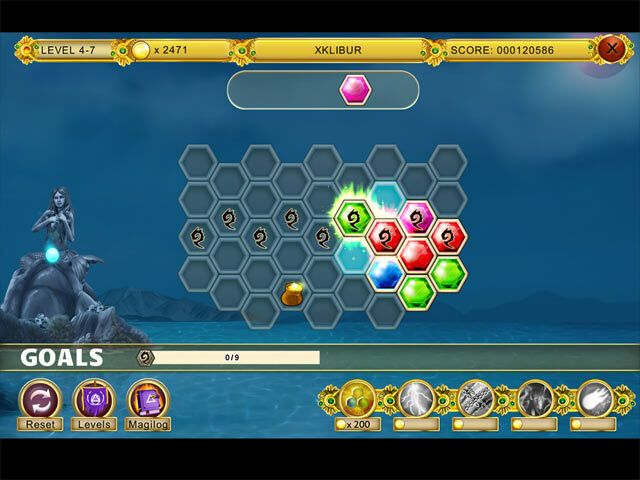 Rated 5 out of 5 by Dayanablack from A different way to play, great game This is a match 3, match 4, etc I played the original DragonScales and this is way better...... it has more modes, more graphics and battles... the game is deceptively simple you may think it's easy but later on difficulty raises and you have to think carefully before playing.... there is a level, level 3-5 or 3-6 I dont remember clearly I think it's the level of the masked guy with the rose where I had troubles finding out how to play the scales in the right way!! At first I didnt know what to do with the coins but later on you're awarded some special powers and you need coins to use those powers..... powers are useful..... I also liked the battles.... IF you want to play at ease play Practice mode...... if you want more challenge play adventure mode. I recommend this game! Rated 5 out of 5 by DRAGONWYN from Sequel better than riginal. I liked the first Dragonscales but this one is even better. You can play the adventure or relaxed without the dialog which can be a bit much but i' an interesting story. I will be buying the game when I get my monthly game credit. I look forward to playing on with the adventure mode. Rated 5 out of 5 by Jem_Jerrica_Guy from I bought this on another site... -because I couldn't wait. A new type of challenge every location which is about 15 to 16 levels each. These include matching certain preset color tiles and locations to placing 4 instead of 3 tiles on the game board. Some of the puzzle levels can't be undone (like prioritizing certain tiles with special abilities), so starting a certain level over can be a pain, but you can turn off the music and play your favorite tunes to pass that time by.